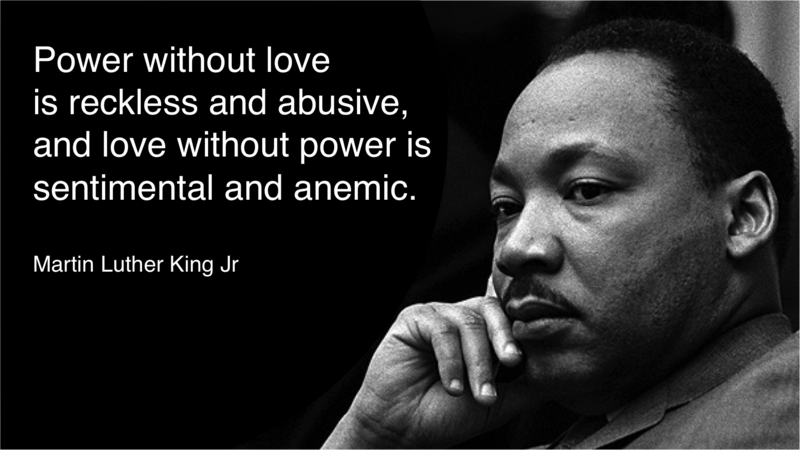 Power without love, and love without power – Martin Luther King jr.
and love without power is sentimental and anemic. Power and love are not separate and in opposition but two parts of the same whole. How do use your power? “What happened is that some of our philosophers got off base. And one of the great problems of history is that the concepts of love and power have usually been contrasted as opposites – polar opposites – so that love is identified with a resignation of power, and power with a denial of love. It was this misinterpretation that caused Nietzsche, who was a philosopher of the will to power, to reject the Christian concept of love. It was this same misinterpretation which induced Christian theologians to reject the Nietzschean philosophy of the will to power in the name of the Christian idea of love. Now, we’ve got to get this thing right. What is needed is a realization that power without love is reckless and abusive, and love without power is sentimental and anemic. This entry was posted in Crazy World, Ideas and tagged Dr Martin Luther King Jr, Power and Love. Bookmark the permalink. 3 Responses to Power without love, and love without power – Martin Luther King jr. Thank you for sending this message! I have to try to do something about it! The first comment was not mine! We want love instead of psychiatry!